Filter by Standard Preorder Bonus Deluxe Ed. Steam Gift Ultimate Gold Ed. Information from Assassins Creed Odyssey for PC in digital version. The PC version of Assassins Creed Odyssey is exclusively digital, so it can only be purchased through the Ubisoft online store or at a store that offers Assassins Creed Odyssey digital keys for activation in Uplay. In addition to the standard version, there are also other versions such as the Deluxe version and the Gold version. Each of these versions offers different content and extras that will be provided to us at the beginning of this great adventure set in ancient Greece. How can I get Assassins Creed Odyssey for PC at the best price? Only from Gocdkeys you can find a daily updated list with the best offers for this Ubisoft game. 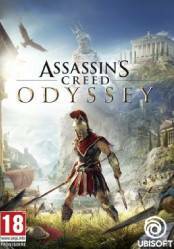 Every day the offers of the stores are updated, which offers our users the possibility to find any of the available versions of Assassins Creed Odyssey at the best price. It is possible to filter, from our selector at the top of the list of stores, the different versions to locate them more quickly and easily. We would like to point out that Ubisoft games usually have a regional block. Most of the versions that we show in Gocdkeys are activation in the region of Europe, although it is also possible to find other regions, so before buying it read carefully the information about it in each of the stores. If I don't buy it in Ubisoft, how can I activate the digital key? If you buy through Uplay the activation is instantaneous, although it is much more expensive. If you buy from another store, you can enter the key in Uplay's launcher to activate the download of the game. To do this, once we receive the code in our email, we must access our Uplay account and access the "Activation" section located on the top right. In this section, enter the password in "Activate a code". Once this is done, Uplay will detect the redeemed game and start downloading it to your computer. It is the largest of the Assassins Creed that have been released to date, and very similar to the previous release, Assassins Creed Origins, in terms of its RPG model, combat system, progression system,... A huge open world full of unexpected encounters in untamed environments and in bustling ancient cities. The choices we make throughout this epic adventure will shape the world in which we will move. Another novelty that has been confirmed is that we will be immersed in huge battles of 150vs150 Greek warriors, where our coordination and concentration will be decisive if we want to come out alive from these clashes with sword, shield and spear. Another novelty is the possibility of visiting all the Greek islands through our own ship, which we can customize in many ways, adding weapons, changing the look, recruiting warriors for our crew and much more, as happened in Assassins Creed 4. I hate game wheel try lucky to win, nobody win nothing! One year and only 2x steam key cheapest steam game. Can anyone confrim try lucky to get free is scam? amazing game i have around 120 hours on pc and enjoyed every bit of it. Great story and a lot of content. Cant wait for the fate of atlantis dlc. Great story and characters, but the only down side is, that the side missions get a bit too repetitive overtime, and it becomes a bit grindy. Overall this is a great game you should pick up it up, but I would recommend to wait and buy it on a sale. De nuevo otra maravilla mas de la saga. Jugando estoy y disfrutando como un enano en un mundo increiblemente grande y extenso. Y encima en una epoca que me encanta. I'm simple man. If i can kick someone off the cliff shouting THIS IS SPARTA, then i'm happy. Of course you can climb big statues with great view.